The best stories draw you in at the onset and don’t let you go. You aren’t just reading words, you’re experiencing the story. Author Jamey LeVier returns to the literary world armed with the story of “The Dedd House” (published by Balboa Press). This new novel is an exploration of the inner man through the protagonist’s quest to find the proverbial light at the end of the tunnel. Danny Dedd had what he thought was a perfect life: the career of his childhood dreams, the full support of wealthy parents, and married to his college sweetheart with their first child on the way. Then, like a strike of lightning, everything was torn away, propelling him into a dark and dreary world. Determined to overcome, he charted a voyage of renewal, only to find grave challenges at every turn. His quest took him to shady places with peculiar people. Readers are invited to join his journey and witness if he will find a light of hope at the end of that long, dark tunnel. Providing an exciting exploration of the human psyche, Dedd’s story resonates with each reader who seeks to travel and explore their inner self as well. “The Dedd House” is a thrilling ride into the oft unexplored territories of the human mind. The best stories draw you in at the onset and don’t let you go. You aren’t just reading words, you’re experiencing the story. Days after finishing, you still think about the characters, still feel the emotions, still replay scenes, still remain wowed by the conclusion. 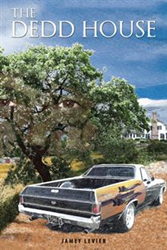 And so it is with Jamey LeVier’s “The Dedd House.” Captivating, heart-wrenching, disturbing, engaging, satisfying — the author takes your emotions and senses on a wild ride! Jamey LeVier is a published novelist, freelancer and poet. His novels include “Rose Buddies” (Xlibris 2007) and “The Dedd House” (Balboa Press 2016), and he has written numerous articles, short stories and poems. LeVier is a member of the National Novel Writing Month Society (nanowrimo.org) and frequently attends writing webinars and workshops. A native of Western Pennsylvania, he currently lives in Valdosta, with his wife Jennifer, six rescued cats and a talking parrot. Balboa Press, a division of Hay House, Inc. – a leading provider in publishing products that specialize in self-help and the mind, body, and spirit genres. Through an alliance with indie book publishing leader Author Solutions, LLC, authors benefit from the leadership of Hay House Publishing and the speed-to-market advantages of the self-publishing model. For more information, visit balboapress.com. To start publishing your book with Balboa Press, call 877-407-4847 today. For the latest, follow @balboapress on Twitter.